“Rescue Me” is a recurring column by Samantha Randall, editor-in-chief at Top Dog Tips. She’ll provide personal anecdotes and perspective about her life as a pet lover with a passion for cat and dog rescue. Today, she talks about why it might not be the right time for you to rescue a dog. Maybe those sad commercials have pulled at your heartstrings for too long. Or maybe you are ready to give into your kid’s pleas for a dog. 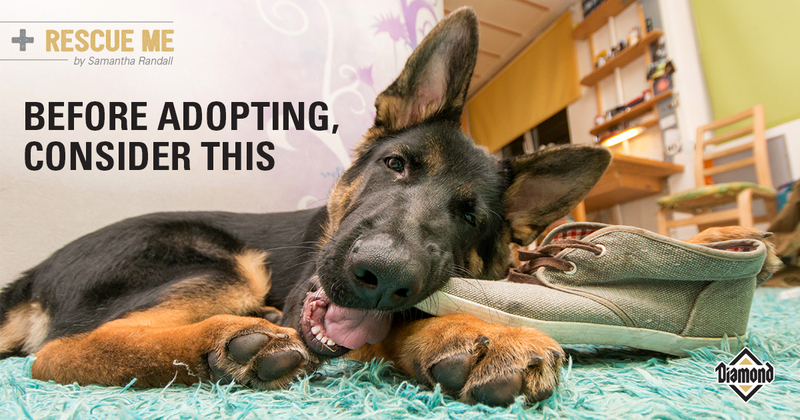 Whatever the reason, you have decided to adopt a dog. While you probably believe that this is a good decision (saving a life, right?) here are a few reasons why adopting a dog may not be for you (at this time). Consider how much free time your schedule allows. You regularly rush out of the house to make it to work. You rush home to get your kids to practice or other after-school activities. Afterwards, you barely have time to hit a drive-thru for dinner. Then it is homework, baths and bedtime stories. Before you go to bed, you try to squeeze in a few chores — and hit the hay exhausted. If this is you on an average day, a dog is not for you right now. Having a dog takes more than filling a food bowl and opening a door for potty breaks. Dogs need exercise. They need social time with their human family. They get bored and depressed just like people. When that happens, they may exhibit destructive behavior, act out by having “accidents” in the house, or obsessively chew their skin and paws. Dogs also need training, which means that someone needs to be available to teach them not to chew on the shoes, to go to the bathroom outside, to come and stay on command. It takes time to exercise them and to give them the love and attention they deserve. If you are always flying by the seat of your pants with barely enough time for yourself in your everyday life, it may not be the time to adopt a dog. This pet will exclusively be a tool to “teach responsibility” to a child. A pet probably shouldn’t be a child’s first responsibility in life. I know, I know, everyone says a pet is a great way to teach responsibility. Just hear me out. When you get a pet to teach children responsibility, it is often the pet who suffers, and you’ll need to step in and pick up the slack. You may want to consider waiting until your kids are a little older and more mature, unless you plan to take on the pup yourself. Your life is currently in upheaval, or you are not quite settled. When you adopt a rescue, you should only do so after thoughtful consideration of both your situation and the animal’s. If you’ve had serious recent changes in your life, like a sudden move or brand-new job, consider waiting until things settle down a little before heading to the local shelter. Otherwise, you risk your new four-legged friend not fitting into your new situation, and that’s not fair to you or the animal. It’s OK to wait; there will still be plenty of available pets when you are ready. Someone in your household is not a dog person. Maybe you love dogs and you really want one, but your partner isn’t keen on the idea. Don’t get a dog thinking that you can take care of it and the other person will be fine. Pets don’t work that way. A dog is a family pet. There may be times when you are not home and your partner has to let the dog out, walk the dog, feed the dog, clean up after the dog or play with the dog. It happens. Canines are known to be great at reading people and our emotions. If they know someone doesn’t like them, they will try harder to get that person to like them. This may end up making the situation worse. You don’t want to have to choose between your family member and your pet at some point down the road. Everyone in the home has to want the dog and be committed to making sure the new four-legged family member has a good life. If this isn’t the case, it can not only drive a wall between the family member and the pet, but it can drive walls between family members, too. You need to have an honest conversation to make sure everyone is OK with the idea and knows what to expect. If you can’t bring the dog home to a family in agreement, it is best not to adopt a dog right now. There’s no wiggle room in your budget. You really want a dog. You have saved up the money for the adoption fee, to get it neutered, and to get its first-year vaccinations. That’s great, but what about everything else? What about when he or she tears up your work shoes six weeks after you get them? What happens when he or she pees on the carpet and your landlord charges you a cleaning fee? What happens when he or she gets sick or injured and you have to pay unforeseen vet bills? When you get a dog, you get unexpected expenses. Having a dog and then having to give them up because you can’t afford necessary care is heartbreaking. Just remember that there are more expenses tied to a pet than just the up-front adoption fees.